I don't do well having to decide whats for dinner last minute. Hence, my attempt at planning. Lately I've really needed some inspiration. Thank goodness for food blogs and Pinterest! Here's my plan. Monday is easy - I got a 50% off coupon for a Top N Bake Pizza from the Raleys / Bel Air Try It! program. I"ll let you know how it was next week. And with some crazy whim of ambition... I would like to try and make this yummy Blueberry Cream Cheese Coffee Cake. Enjoy your week! 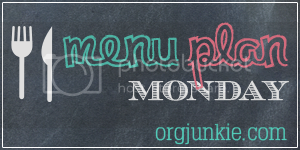 More menu's at orgjunkie! 6/25 UPDATE: My week has already gotten messed up - so I revised it (above.) Also I wanted to share a great cookbook in honor of the great James Gandolfini passing away. I hope you have a wonderful week. Everything on your menu plan looks amazing.